The sports for people with disability in the space? The project is called "Sport Challenge Innovation", students are assigned to design a new sport for people with disabilities in a specific environment. We were given the space as our design condition. We set the scenario in the near future (within 50 years), when space traveling is affordable for anyone. First, we interview the athletic who had participated in the Paralympic. Through the talking, we get to know more about what are the motivation for them to pursue those sport despite some difficulties. Next, we contacted with 2 professional from NASA, Tibor Balint, who is a NASA Space Technology Mission Directorate and Dana Bolles, a NASA researcher who born with no arm and no leg. They share the knowledge about the space and show us what kind of limitations are there. We want to make a use of zero gravity in space and start with coming up a mood board about the space. 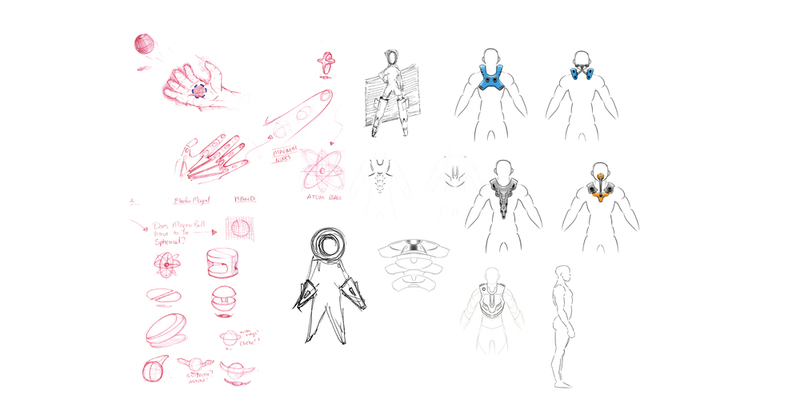 We also did sketches on some ideas we had for the space sport equipments. We realized that most of the sports are evolved from basic human needs. For examples, car race are developed after cars are invented; shooting are developed from hunting. Thus, we decided to follow the same path. The mobility need in the space is something that comes to our mind. The space suit and the astronaut propulsion unit are designed for able-bodied people to use. We focus on improving the existing propulsion unit and make it suitable for everyone. The new propulsion system is located at the center of user's body which give a better balance and works for people without any arm and leg. The system will voice activate in the near future and mind control later on. We believe that with this propulsion unit, it has the potential to develop into space gymnastic. While people tend to move with this device, there are more and more beautiful movement and gestures can be done with the help of this system.